This morning, our Ranby Parents' Group held another successful 'Bags2School' fundraising event. We caught up with RPG Chair, Tori Eadington who gave us an overview of the event. "Yet another successful Bags2School at Ranby House this morning with a fabulous £180 raised for Ranby Parents' Group. 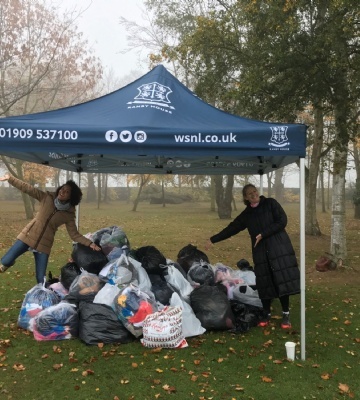 Thankfully with no rain in sight, Vice Chair Sarah Cox and RPG volunteer Juliana Di Leonardo, wrapped up warm and were on hand to help parents unload bags of unwanted clothes and other items, that were crammed into car boots, as they pulled up along the drive. This simple fundraiser not only provides great funds for the RPG, but is also a great excuse for a good clear out without having to go to the tip! Monies raised by Ranby Parents' Group go back into school to fund projects such as the annual sky diving trip, books, equipment, and various other items to enhance our pupils learning experience and enjoyment of school. Thank you to everyone who donated their unwanted items."